The photo at right shows a blue sport ATV with front brushguard, tie-down racks, and halogen headlights; the video shows two people riding ATVs on sand dunes. 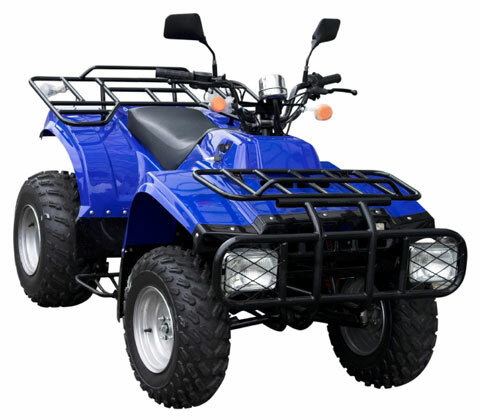 The ATV manufacturers listed below offer a broad selection of sport and utility ATV models, as well as parts, accessories, and apparel. Browse photos and specifications, learn about standard and optional ATV features, and locate ATV dealers in your area. New model lineup, past models, photo gallery, wallpapers, and ATV resources. ATV models, clothing, accessories, parts, resources, and dealer locator. Features sport and utility ATVs, resources, and a dealer locator. Industry leader offers innovative and practical all-terrain vehicles. New and recent ATV models, innovations, tech center, and buyer's guide. Online showroom, news, accessories, special deals, financing, dealers, and riding guides. Features sport, utility, and youth ATVs as well as ATV accessories, parts, and service. Manufactures amphibious all-terrain vehicles for up to 6 passengers. ATVAccessories.us is a Chosen Sites™ information source.